Sometimes there's a chill out but you don't want to crush your hair with a hat you'll have to carry around all day or hang up. The Wigwam F4002 black headband is a great alternative when it comes to keeping those ears from freezing into ice flaps. This acrylic head ... (see full details) (see specifications) #WGWF4002-1003-052. Sometimes there's a chill out but you don't want to crush your hair with a hat you'll have to carry around all day or hang up. The Wigwam F4002 black headband is a great alternative when it comes to keeping those ears from freezing into ice flaps. This acrylic headband has a narrow brow and is wider in the back to cover your ears better, and will fit easily into your pocket. An inexpensive guard against the cold, this headband is a great addition to your winter wardrobe when you work in the most harsh conditions. This Wigwam headband that is sure to keep your ears warm and trap the heat in your body is made of 100% Acrylic fibers. I plan on having this little warmer with me this winter, and figure I can still wear my cap over it. I am getting each one of my kids one of these ear warmers. I have purchased little appliqués I am sewing on for the girls, and got football pins for the boys. This is my second review for an item that I purchased at working person.com. 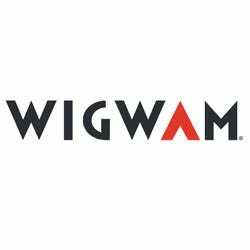 While shopping for some new wrangler jeans, I stumbled across the wigwam ear warmer headband. It's funny because I had just purchased a ear warmer and was complaining that the headband was too skinny and didn't really cover my ears properly. Then I noticed the wigwam and it was thin in the front and wider around the back and sides to make sure that your ears are covered and properly kept warm. Talk about a perfect fit! They even offer custom embroidery for a personal touch. I highly recommend the wigwam headband. Picked this up with the intention of wearing it under my beanie hat for added ear warmth. It's not too heavy and not too light. Works great under another hat. As a bald guy I'll never be using it solo, but as an added layer on a cold day, it works exactly as I had hoped. For the price, it's a great buy! Wigwam Black Acrylic Headband F4002 052 is being added to your cart.